Butchery will be another post. Yesterday was the actual eating day. 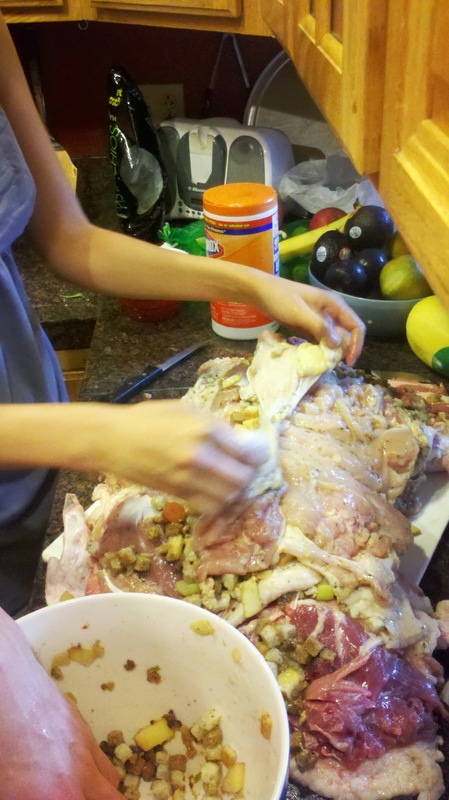 This post is about what I did yesterday- finishing up the stuffing with that delicious duck-chicken stock, sewing together a turducken, and eating the results! If someone steals this I will be so angry and there ‘ll be GEL TO PAY. 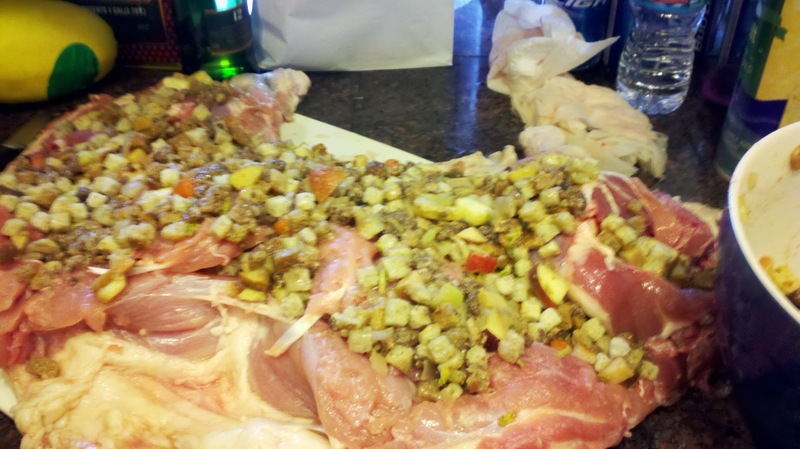 Nuked for thirty seconds, then mixed with my pre-made stuffing (sausage, apples, walnuts, onion, celery, carrot, stuffing mix) in order to put on the birds! 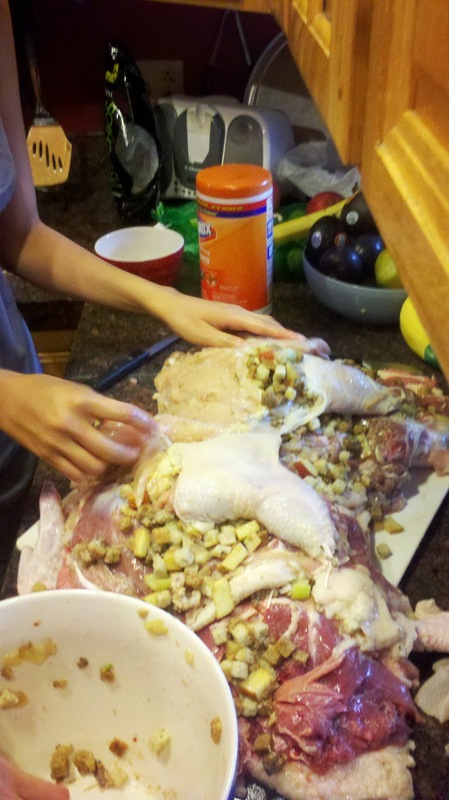 I laid out my turkey flat, then covered the entire thing with a thin layer of stuffing. TIP: next time, I think I’ll cut off the fillet-looking pieces of turkey breast and put them inside the chicken. As it was, we had a huge layer of turkey on the outside, and I think putting it in the middle would help differentiate the birds. This guy was born and bread to become a turducken. 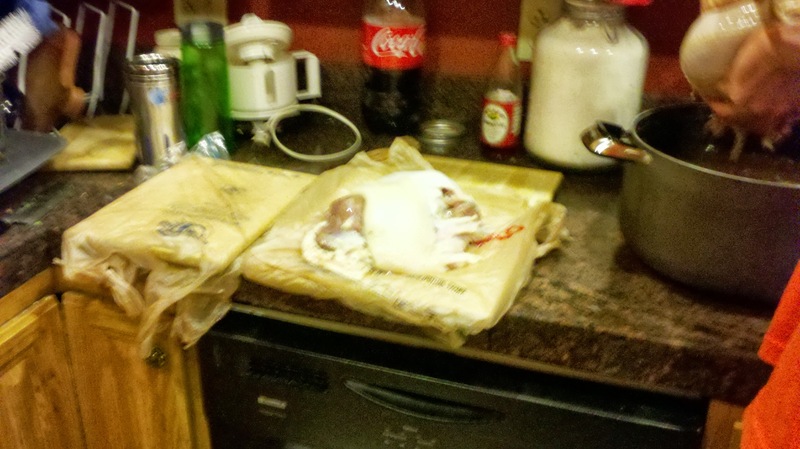 Next, we took out the chicken and duck which had been brining overnight. 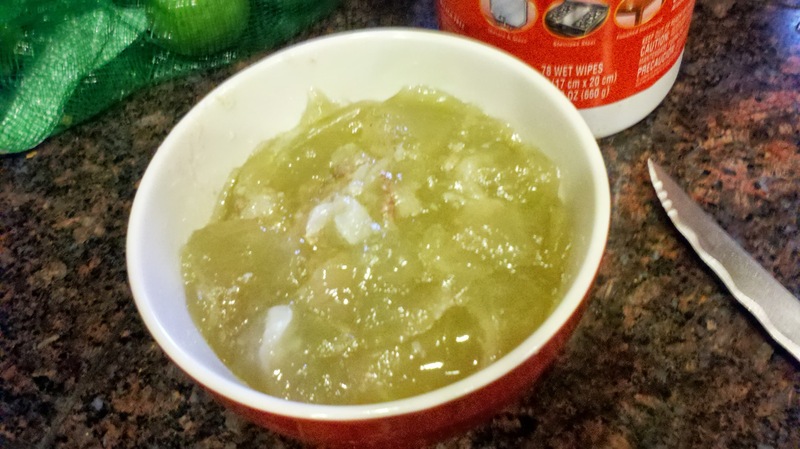 (Based on my computer’s web history, boyfriend used this recipe from allrecipes to make the brine). 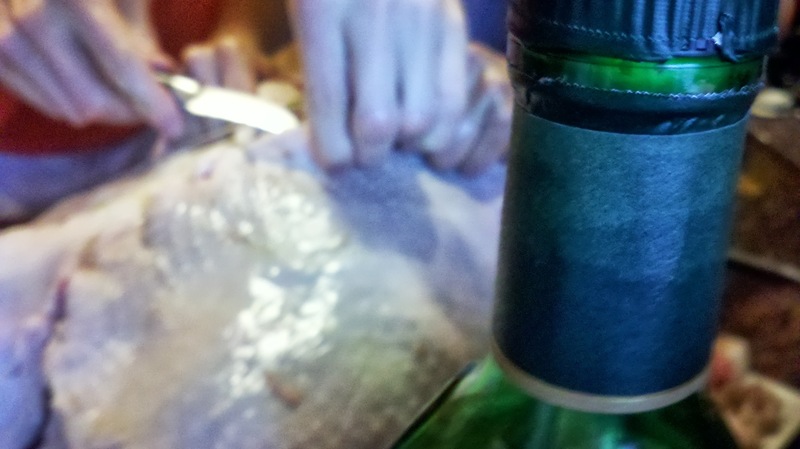 TIP: you should try to brine all of the birds. Because of our unfortunate Jewel incident I couldn’t brine the turkey as it was thawing overnight (we moved it to fridge for overnight and thawed in a cooler in the morning, and I still ended up having it frozen in the middle as I carved). Rinsed those suckers off, then layered them on top of the turkey with more stuffing. Last year we used the internet and barbecue skewers to put our turkey together. BIGGEST TIP IN THIS POST: don’t use skewers, use butcher’s twine (in the utensils area of the grocery store) and turkey lacers and a small, sharp knife. I had my roommate take photos of the process because my hands were covered in poultry (you guys my hands got so dry these two days because I had to keep stopping, washing my hands, taking a picture, and going back again), but we were super in the way so there’s just a hint of what we did. Three birds in four hands is worth… how many birds in the bush? 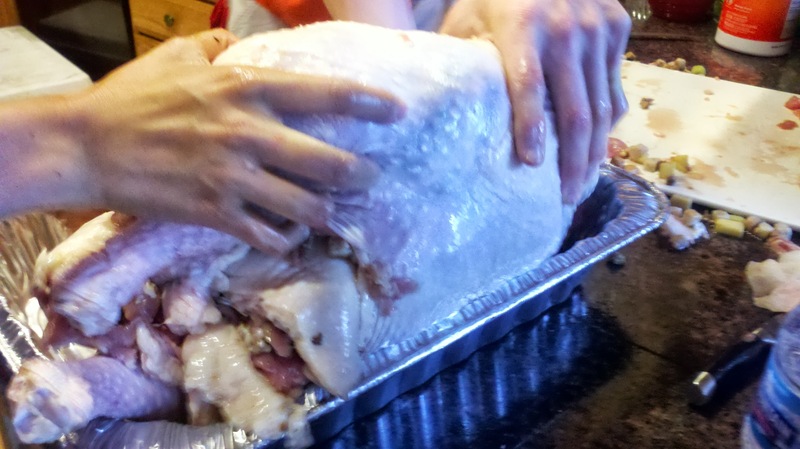 Basically we folded the sides shut so the turkey looked like a turkey, then cut small holes in the skin/meat near the edges of the turkey and used a turkey lacer as a needle with the butcher twine as thread. Then we threaded the turkey shut like shoelaces in a shoe. I really can’t WhINE too much about this picture: I think it looks really cool even if you can’t see what we’re doing. Once it’s shut, it looks just like a distended turkey! The chicken and duck are a secret! I love assembling the turducken. And it’s much easier to manipulate when it’s sewn shut rather than skewered: last year we needed three people to move it, and this year just two of us did so easily- even one could probably put it in a roasting pan. BE VERY CAREFUL with that baby taking it in and out of the oven. I actually have no photos of the carving or devouring stages. Carving just happened in chunks, and we had about 25 people come eat. We probably ate about 3/4 of the turducken. One thing we did do was put the turducken on a rack to let it dry, and we wish we had roasted it in a proper roasting pan so it wouldn’t boil in its own juices. I used those juices to make gravy: melt two tablespoons of fat/butter, add in two or three tablespoons of flour and whisk until smooth, then pour in two or three cups of stock (I skimmed off LOTS of fat before this step). Bring it to a boil and let it boil for a few minutes, whisking every now and again, until its thickened. Delicious. 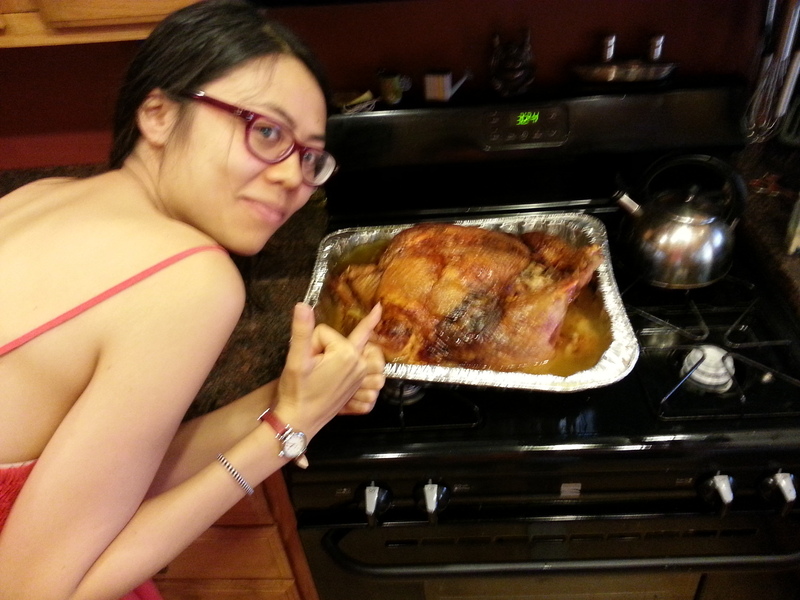 We didn’t baste the birds because brining will keep them moist, but we should’ve because we didn’t brine the turkey. It was a little dry, but nothing gravy couldn’t fix. On the whole it was a delicious and wonderful Thanksgiving! Friends brought sweet potatoes, brussels sprouts, dressing, garlic soup, broccoli salad, asian noodle salad, banana bread, and cake!